India’s plastics processing sector is expected to grow 10% a year through 2018, although from a small base, as the manufacturing industry and economy shows signs of rebounding, according to industry statistics released at the Plastindia trade show. The country’s plastics market will reach 18 million tonnes of material processed by 2018, but will still face many challenges, including having too many small companies that are not competitive globally, according to an analysis by a senior executive at India’s largest plastics producer, Reliance Industries Ltd. In general, though, there were positive signs, including low oil prices that make the country’s naptha-based plastics feedstock more competitive. “Economic recovery is underway,” said Ajay Shah, head of Reliance’s polymers and cracker unit, speaking at a 6 February conference attached to the Plastindia show, held 5-10 February in Gandhinagar in India’s Gujarat state. “I think the reform momentum has picked up,” Shah said, arguing that economic policies of India’s new Prime Minister Narendra Modi may provide a boost. 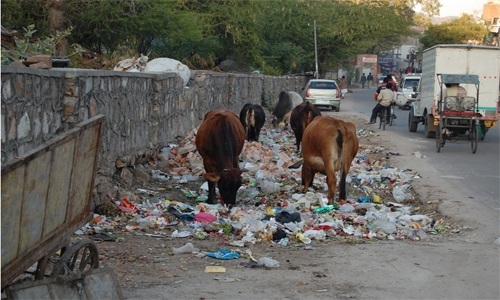 Plastics consumption in India remains very low by world standards, with per capita plastics use at about 9.7 kg in India, compared with 45 kg in China and 109 kg in the US, Reliance said. What that means is that India, with 17% of the world’s population, accounts for only between 4% and 7% of global plastic demand, depending on resin type, Shah said. Drivers of demand include agriculture, infrastructure, food packaging, automobiles and medical manufacturing, which are all fueled ultimately by rising consumer income, Reliance said. “Penetration in some of these areas could be low today, but as it increases, that provides great potential for growth,” Shah said. A study released at the show by the Mumbai-based Plastindia Foundation in particular singled out the flexible packaging industry, saying it was “poised for strong growth” and had been insulated somewhat from India’s slowing of growth rates in the last two or three years. “New applications/innovations in packaging development are driving growth in India and these are ably supported by the current and upcoming domestic capacities,” the report said. Shah also mentioned several government social or environmental initiatives that could benefit plastics in India, including spending on water infrastructure, food security and storage and affordable housing. Some markets for plastics have struggled, though. India’s passenger car market has not grown in several years, with the country buying about 3 million cars a year. The passenger car market actually shrank by 5% in its fiscal year ending 31 March, to 3.07 million vehicles. “India’s plastics penetration into traditional material based goods is yet to gather momentum,” Reliance noted, specifying automotive and households goods as examples. India’s use of engineering plastics in cars, for example, is about half per car compared to developed markets, according to information from Dutch resin manufacturer Royal DSM N.V. But India is likely to catch up quickly, in part as auto makers increasingly have global platforms and want standardized platforms for manufacturing vehicles, said Sanjay Jain, business director — India, for DSM.